Malala Yousafzai, the 14-year-old Pakistani girl shot in the head by Taliban gunmen last week, is being flown to the UK for medical treatment, the Pakistani army has said. Malala Yousafzai has until now been at a military hospital in Rawalpindi, with doctors saying her progress over the next few days would be “critical”. The girl wrote a diary about suffering under the Taliban and was accused by them of “promoting secularism”. The UK said Malala Yousafzai’s transfer followed London’s offer to help her in any way. Malala Yousafzai was taken to Islamabad and then left the country on board an air ambulance provided by the United Arab Emirates, accompanied by a full medical team. The military said her doctors in Rawalpindi were “pleased with her present condition which has been described as optimal”. “The panel of doctors recommended that Malala be shifted abroad to a UK centre which has the capability to provide integrated care to children who have sustained severe injury,” it said. Malala Yousafzai is expected to need treatment to repair or replace damaged bones in her skull and to undergo neurological treatment. The UK said it would not release information about where she was being taken to respect patient confidentiality, but said it had “capacity for Malala to be treated without affecting the normal operations of the hospital”. The UK’s Foreign Secretary William Hague said the attack on Malala Yousafzai and her friends “shocked Pakistan and the world” and that her bravery was “an example to us all”. 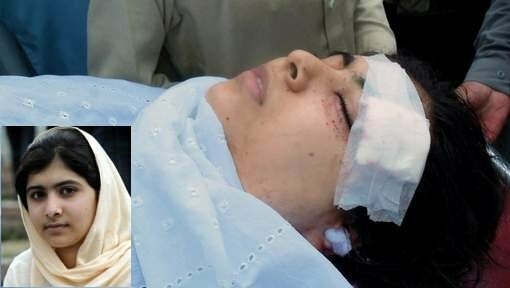 Malala Yousafzai – who was a well-known campaigner for education for girls – was attacked last Tuesday as she was returning home from school in Mingora in north-western Swat. Two armed men, on foot, stopped a van packed with about a dozen schoolgirls in a congested area of the town. One of them got into the van and asked which of the girls was Malala Yousafzai before he fired three shots, hitting Malala in the head and injuring two others. The Taliban has warned they will target Malala Yousafzai again. Malala has been kept sedated and on a ventilator since she was taken to hospital, with tight security around her. The ventilator was removed briefly over the weekend to see how she coped and presumably have determined she is well enough to travel. Four people have been arrested in connection with the attack. They were among about 100 people rounded up this week, most of whom were later released on bail. On Monday, former British Prime Minister Gordon Brown, who is now the UN’s Special Envoy for Global Education, said he was launching a petition in Malala Yousafzai’s name “in support of what Malala fought for”. “Today, sadly, 32 million girls are not going to school and it is time to fight harder for Malala’s dream to come true,” he said.